In 2016, there was an obituary written for the Great Barrier Reef. The cause of death: climate change and ocean acidification. It died at the age of 25 million. Australian scientists confirmed this is not far from the truth — if drastic action to save the reef is not taken. In a media release by the James Cook University, scientists conducted a survey last year in which they recorded severe coral bleaching across huge tracts of the Reef. They completed aerial surveys along its entire length. Reports said that while bleaching was most severe in the northern third of the Reef, the middle third has experienced the most intense coral bleaching. Prof. Terry Hughes, Director of the ARC Centre of Excellence for Coral Reef Studies, who undertook the aerial surveys in both 2016 and 2017, said the combined impact of this back-to-back bleaching stretches for 1,500 km (900 miles), leaving only the southern third unscathed. The bleaching is caused by record-breaking temperatures — even without the effects of El Niño conditions. The aerial surveys in 2017 covered more than 8,000 km (5,000 miles) and scored nearly 800 individual coral reefs closely matching the aerial surveys in 2016 that were carried out by the same two observers. Coupled with the 2017 mass bleaching event, Tropical Cyclone Debbie struck a corridor of the Great Barrier Reef at the end of March. The intense, slow-moving system was likely to have caused varying levels of damage along a path up to 100 km in width. Any cooling effects related to the cyclone are likely to be negligible in relation to the damage it caused, which unfortunately struck a section of the reef that had largely escaped the worst of the bleaching. The Australian Conservation Foundation (ACF) blasts the mining and fossil fuels industry as well as the lack of government action. Mining and burning of fossil fuels– like coal – are warming the oceans and killing the reef, the Foundation claims. Kelly O’Shanassy, ACF director said this is a global tragedy blaming the Australian government and coal companies for undermining action on global warming. O’Shanassy said in order to have any chance of saving the rest of the reef, there should be a stop in digging up and burning coal and take the alternative — to rapidly repower Australia with clean energy. Sea Shepherd’s Operation Icefish ended early this week with the bizarre sinking of Interpol-wanted vessel, The Thunder, inside the Exclusive Economic Zone of Sao Tome. After 110 days of action, chasing the elusive vessel, Sea Shepherd Captain Paul Watson said the campaign has accomplished its mission. The longest hot pursuit of a poaching vessel in maritime history, Operation Icefish has been “the most successful intervention against high-seas poaching in the history of anti-poaching operations,” the captain said. Thunder, the most notorious of the so-called “Bandit 6, was sunk deliberately by its crew as they clapped and cheered, media reports said. It was left with clear signs that the vessel was intentionally scuttled. The hatches were not closed to maintain buoyancy, but instead, the doors and hatches were tied open, along with the fishhold. The vessel then went down 4,000 meters below. Watson is convinced the vessel was scuttled as a deliberate act of desperation. It was allegedly owned by unscrupulous and wealthy fishing companies based in Galicia, Spain. The Australian government has finally decided to do something about illegal fishing vessels. And when Australian Customs officials recently took out their patrol ship they met Kunlun, a notorious and elusive poaching vessel cruising on its way with a massive haul of Patagonian toothfish. Another major blow has been dealt to illegal fishing in the Southern Ocean with the detention of the Nigerian-flagged poaching vessel, Viking, in Malaysia – bringing a total of three notorious illegal fishing vessels and their crew in for interrogation this fishing season. Nigerian-flagged the Thunder was de-registered last week making it officially stateless. Kunlun, meanwhile, is in Thailand’s detention. Held for violations of Malaysian maritime law, Malaysian authorities have indicated that the Viking will also be investigated for alleged illegal, unregulated, unreported (IUU) fishing violations. READ MORE…. Australian Minister for Immigration and Border Protection Peter Dutton urged the international community to forge cooperation to combat Illegal, Undocumented, and Unregulated (IUU) fishing following the arrest of poaching vessel, Kunlun, in Thailand. Dutton said Australia works with international partners through the Regional Plan of Action with Southeast Asian countries to address illegal fishing. Australia alerted Southeast Asian nations about the expected arrival of Kunlun into their ports at any time. The vessel was found anchored off Tapaonoi island, near Phuket, and is now being detained, according to a local report by Phuketwan. Phuket Marine Police authorities dispatched teams to gather information so that investigation will commenced shortly. In the US, the Presidential Task Force on IUU Fishing and Seafood Fraud released its action plan that sets out the aggressive steps to curb IUU fishing. The plan is based on the recommendations of the Task Forced made in December 2014 that federal agencies will take both domestically and internationally . The plan identifies actions that will strengthen enforcement, create and expand partnerships with state and local governments, industry, and non-governmental organizations, and create a risk-based traceability program to track seafood from harvest to entry into U.S. commerce. WWF considers the action plan as a “crucial win” for the European Union and the global community to confront illegal fishing. The conservation group also said the plan will further boost the EU’s strong action to fight against illegal fishing, which is estimated to cost between EUR 8 billion and EUR 19 billion annually. Eszter Hidas, EU Policy Officer for WWF’s Illegal Fishing programme, said the world’s two biggest fish importers seem now determined to close their doors to any illegal fish product. IUU fishing represents 11 million to 26 million tonnes of catch, which accounts for 13-31 per cent of global catch, according to WFF. Michele Kuruc, vice president of ocean policy at WWF-US, also said that the action plan marks “a decisive shift” in US policy. The plan is a way to put black market enterprises on notice that the country is closing its doors to their illegally caught seafood, she added. The Kunlun was intercepted by the Royal New Zealand Navy in the Southern Ocean in January, but eluded arrest. The Australian Customs and Border Protection Service (ACBPS) was patrolling the seas in February and caught the vessel in the Indian Ocean while on its way north. Australian Customs boarded Kunlun to verify the flag State of the vessel. Kunlun has a long history of IUU fishing in the Southern Ocean and is the subject of an INTERPOL Purple Notice seeking information on the individuals and networks that own, operate, and profit from the actions of the vessel. “The Australian Government will continue to provide support as necessary. It will continue to take effective action, together with our international counterparts, in order to send a strong message that IUU fishing will not be tolerated,” Senator Colbeck said. The Great Barrier Reef is facing serious threats from climate change, and ongoing coal projects make it even worse. The Carmichael Mine Project, located in the Galilee Basin, will go ahead despite warnings that coal transported from the mining site to the Abbot Point Port will cause irreparable damage to the Great Barrier Reef World Heritage Area. A new scientific study says the reef could be destroyed by environmental change before the end of the century. The Commonwealth Scientific and Industrial Research Organisation (CSIRO) and Bureau of Meteorology (MOB) forecast that Australia will be hit hard by climate change as temperatures will rise of up to 5.1C by 2090. Scientists under the Intergovernmental Panel on Climate Change (IPCC) have agreed a limit of 2C if the earth is to avert catastrophe. The Bureau of Meteorology forecasts rising temperature that hit Australia hard. CSIRO’s principal scientist, Kevin Hennessy, said the inland will be most affected but one of the most dramatic transformations are set to take place in the seas that surround Australia, which will warm between 2C to 4C unless carbon emissions are cut. On average, four metric tonnes of carbon dioxide are emitted to the atmosphere per person per year, representing an increase of 30% over the last 250 years. The IPCC monitors these changes. The effect of climate change is already changing the Reef. The Department of Environmentalso confirms sea and air temperatures will continue to rise, along with sea levels, and the ocean is sure to become more acidic. These changes affect reef species and habitats, as well as ecosystem processes, and the industries and communities that depend on the Reef. Tourism, commercial fishing and recreational fishing on the reef together contribute $6.9 billion to the national economy per year. Unusually warm sea temperatures have already caused serious and lasting damage to 16% of the world’s coral reefs. The Great Barrier Reef has experienced eight mass bleaching events since 1979, triggered by unusually high sea surface temperatures. The most widespread events occurred in 1998 and 2002 with more than 50% of reefs bleached. Coral bleaching is a natural process but the rate is increasing faster than ever before. The Federal Government gave a green light to the coal project despite warnings from the United Nations that it will put the Reef at risk. Predictions also suggest that the Carmichael mine could produce an extra 130 million tonnes of greenhouse gases over the mine’s lifetime, representing a quarter of Australia’s annual emissions. The pollution from the entire Galilee Basin, if all projects go ahead, will be more than Australia’s entire annual greenhouse gas pollution. “That intermediate emissions scenario would have significant effects for Australia,” Hennessy said. “Coral reefs are sensitive to even small changes in ocean temperature and a 1C rise would have severe implications for the Great Barrier Reef and Ningaloo reef. The forecast is grim for the Great Barrier Reef and if Australia cannot reduce greenhouse gas emissions the future could be very challenging, the CSIRO scientist said. They are misunderstood as pirates, but they are not. The Sea Shepherd and its crew of volunteers are activists guarding the oceans from illegal poachers. And since the Japanese whalers cannot be spotted in the Southern Ocean this season, the crew has been all out to go against illegal hunters of Patagonian and AntarcticToothfish. The Bob Barker ship has been in pursuit of the African vessel, Thunder, since the vessel first fled on December 17. And for five days, the Sam Simon ship chased the poaching vessel. Thunder fled leaving behind a 25-km-long gillnet with a haul of over 200 toothfish and other sea creatures. Majority of which are dead and the surviving crabs have been thrown back into the waters. 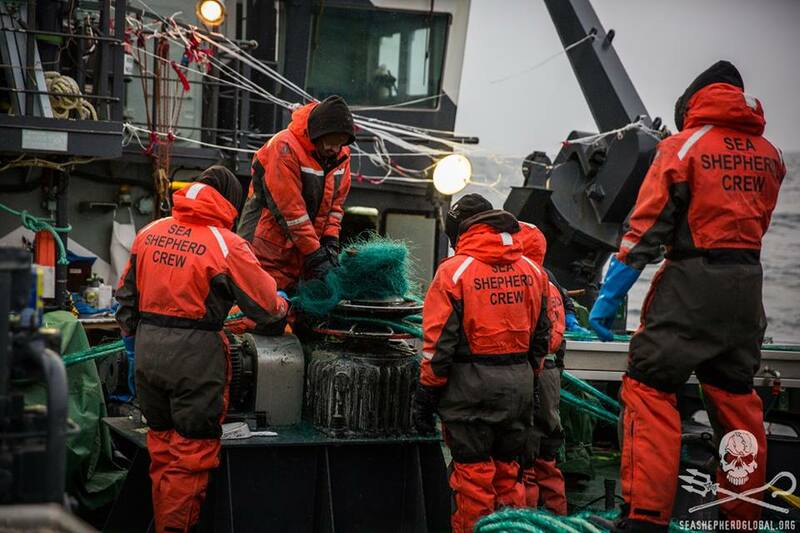 Sid Chakravarty, captain of the Sam Simon, said the retrieval of the illegally laid gillnet set, combined with the pursuit of the Thunder, Operation Icefish has achieved what it had set out to do in less than a month since it kicked-off. The operation has been unstoppable despite criticism on the legality of the ‘pirates”operation in the international waters. Read full story HERE as well as Bob Brown’s press statement on Sea Shepherd’s toothfish operation.